Noah Dickson goes out to receive his award as the Most Valuable Player for the SCW vs. Irene-Wakonda game during the DWU Classic on Saturday. 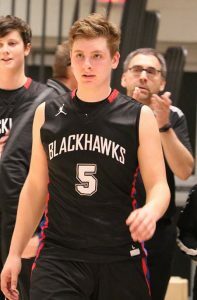 Dickson also earned recognition this week as a Blackhawk because he broke the SCW record for the most points scored in a single game during the Iroquois game. Dickson scored 32 points and the previous record was 30. Photo courtesy of the Woonsocket Media class. The Blackhawks started the week rather easily with a game against Iroquois in Iroquois on Tuesday, Feb. 5. The game ended with a Blackhawk victory and a score of 66-47. Leading the Blackhawks was Noah Dickson with an amazing 32 points. With this number, Dickson broke the SCW record for points scored in a single game. The record was previously 30 points and was held by Trey Weber in 2017 and Dillon Moore in 2015. The JV boys also beat Iroquois with a final score of 32-16. Things got tougher for the Blackhawks at the end of the week when Highmore-Harrold came to Woonsocket for a doubleheader on Friday night. It was a hard-fought game with some tensions a little high, but the Blackhawks couldn’t hold on and they gave up the game to the Pirates with a final score of SCW 46, Highmore-Harrold 57. Highmore-Harrold was a tough foe for the junior varsity boys, as well, but the SCW JV boys ended victorious over the Pirates with a score of 33-30. On Saturday, Feb. 9, the Blackhawks went up against the Irene-Wakonda Eagles for the DWU Classic at the Corn Palace in Mitchell. SCW had a slow start as they were outscored 0-12 before making their first points. However, things started to heat up for the Blackhawks, and they rallied to a one-point lead and the win with a final score of 57-56. The Blackhawks move to 10-8 on the year and will see their next court action in Mitchell for a doubleheader with Mitchell Christian on Thursday, Feb. 14. …Read details and see additional pictures of the games in this week’s issue of the Sanborn Weekly Journal.